Book Review: 'Meddling Kids,' By Edgar Cantero Edgar Cantero's head-kick of a novel about damaged adults who used to be spunky kid detectives mixes bright, pulpy cartoon nostalgia with some seriously dark trauma-survivor subtext. "Tomorrow, Tim, we'll be in Blyton Hills. You know what that is? You've never been there, but your great-grandfather Sean had. It's the best place in the world. ... Swamps where you can build rafts, and caves to take shelter in when it rains, and old mills and barns where hand-wringing bad guys think of their evil plots, and lakes with monsters, and haunted houses where pirates used to live. It's actually a little scary. We're going to need you at your best, soldier. We rely on you." These are not the first words from Edgar Cantero's new head-kick of a novel, Meddling Kids. They're not the last words, or the best words either. But they're the (paraphrased) heart of the thing, spoken by Andy, one of the four main characters, member-for-life of the Blyton Summer Detective Club. Tim, it should be noted, is a dog. A weimaraner, great-grandson of the intrepid Sean — who once, along with a much younger Andy, Kerri, Peter and Nate, used to be a team of child detectives who spent their summers and school breaks in Blyton Hills, Ore., foiling sheep smugglers and chasing fake ghosts out of haunted houses. And once upon a time, in the summer of 1977, they caught the Sleepy Lake Monster — who turned out to be a low-life jerk in a rubber mask trying to scare everyone away from the haunted mansion where he was searching for gold. It was their greatest case ever. They got their pictures in the paper and everything. Does this all sound familiar? It should. To any kid raised up on Saturday morning cartoons, this should all be familiar as breath. The Blyton Summer Detective Club is straight out of any kid's adventure story. Scooby-Doo and the Hardy Boys and Encyclopedia Brown and the Goonies all wrapped up in one neat package (not to mention the obvious — Enid Blyton's Famous Five). 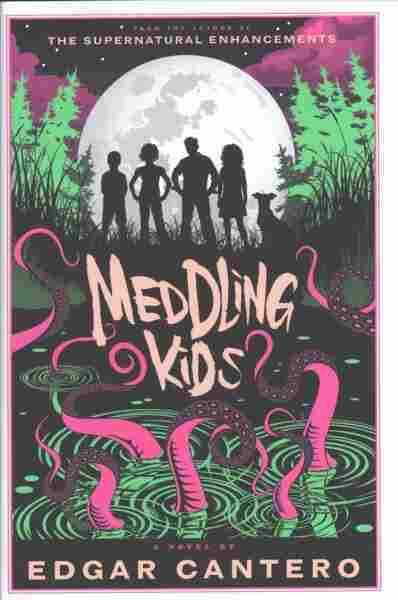 'Meddling Kids' is that rarest of things: a brilliant idea wedded to beautiful and perfectly-pitched execution — this juxtaposition of primary-colored cartoon nostalgia with some seriously dark trauma-survivor subtext. At the beginning of the book, that front-page newspaper article is reproduced. They smiled for the photo, these kids, standing over the bad guy in his rubber monster suit. They are young and invincible. But eventually, the reporters went away. The police. Eventually, the summer ended and they went their separate ways. And none of them ever talked about the corpses hanging from the trees around the haunted mansion. No one talked about what happened down in the dungeons. Now it is 1991. Andy is a felon, wanted in two states. Kerri is drinking her nightmares away in New York City. Nate is in a mental asylum in Massachusetts. And Peter — perfect, strong, movie-star Peter — is dead by his own hand. Suicide, a couple of years earlier (though this doesn't stop him from showing up as one of Nate's hallucinations). But despite this, Andy has decided that it is time to get the gang back together and return to Blyton Hills. To finally solve their biggest case for real. Because something happened to all of them in that haunted mansion, and it has been killing them all slowly for decades. So yes, Meddling Kids is a story about what happened to the Scooby Doo gang after they all grew up. And it is awesome. It is a book that lives completely in the sweet recollections of childhood summers; that exists in the power band of maximum pop-culture self-referentialism. It trades on memory and nostalgia with almost zero ironic distance, just embracing the ridiculousness of its own backstory with both arms, making the surviving members of the gang (plus one hallucination) wear all their damage and all their scars in plain view. They were kids who saw some messed up stuff. They suffered horribly for it, and mostly in silence. Now they're going back to mend those things in them that have been broken. Look, I loved this book end to end and I am using my position as Deputy Commander of the NPR Nerd Army to instruct all of you to read it immediately. Look, I loved this book end to end and I am using my position as Deputy Commander of the NPR Nerd Army to instruct all of you to read it immediately, because it is funny and sad and tragic and pulpy, all in the best possible way. Because it's so deliriously trope-y that your inner child will melt down from joy. Because, as a stylist, Cantero plays tricks with the language that would be maddening if they weren't so much fun, and if they didn't seem to come from a seemingly bottomless well of joy that infuses so much of the story. Mostly, do it because Meddling Kids is that rarest of things: a brilliant idea wedded to beautiful and perfectly-pitched execution — this juxtaposition of primary-colored cartoon nostalgia with some seriously dark trauma-survivor subtext that hits you like icy water every time you start having too much fun; jagged reminders of what it must've been like to be an actual child trapped in a dungeon with the monsters outside scratching to get in, and of the psychic price paid by those who battle monsters. Even when they walk away alive.